Isn’t it the best when someone else’s birthday allows you to celebrate with a treat too? That’s what’s happening today, Saturday, March 3rd. At participating locations, you can get an Auntie Anne’s free pretzel to celebrate the store’s 30th birthday. Happy birthday to Auntie Anne’s — and to us! So, which locations are offering the Auntie Anne’s free pretzel deal? You can find out on the special Auntie Anne’s birthday website. Yes, it’s such a big deal that they have a website just for their 30th birthday. The decadent dough makers have rounded up around four million RSVPs to the free pretzel party, according to USA Today. If you want a free pretzel, expect a crowd as you line up at your local Auntie Anne’s for a free birthday treat. As you probably know, Auntie Anne’s specializes in unique flavors of their doughy treats. From seasonal Pumpkin Spice Pretzel Nuggets to Sour Cream & Onion soft pretzels, they basically have them all. For their birthday special, the stores will offer one free Original or Cinnamon Sugar Pretzel for each guest. Because nothing beats the classics. Especially when the classic is a buttery, salted stick of soft, chewy dough. 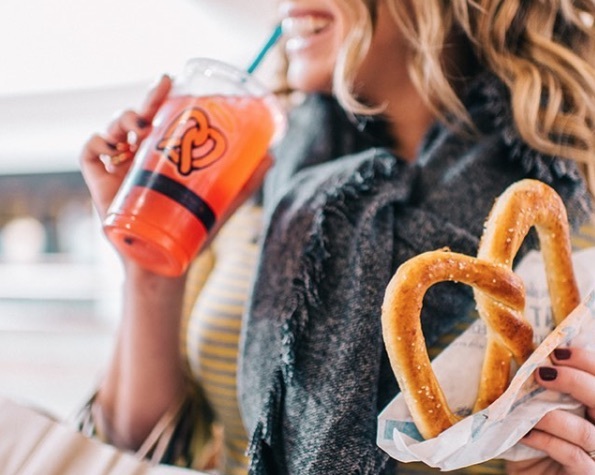 Hurry — get your Auntie Anne’s free pretzel before 2 p.m. today! Considering that millions of people plan to get their own Auntie Anne’s free pretzel today, you might want to get there soon. The pretzel chain has another birthday treat for everyone too. According to USA Today, Auntie Anne’s will hand out buy-one-get-one-free coupons to people who show up to the pretzel party. Suddenly, that birthday slumber party you had in fifth grade doesn’t seem as exciting, does it? May you be as happy as Stanley Hudson on Pretzel Day. Auntie Anne’s officially takes the cake — no, the pretzel — for having the best birthday party ever.